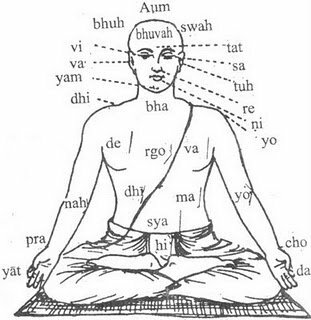 As are full of mantras and hence have been preserved for ages in their pure form by utilizing the various techniques like patha, krama, jaTa, gaNa pATas, that ensure that the chanter clearly gets the correct letters and even the correct level of sound for each letter (svara). The chanters are advised to chant the mantras only after getting the right pronunciation of it, so that the mantras are presered against deterioration with time. 1: Mantras are energy-based sounds. 2: Mantras create thought-energy waves. The human consciousness is really a collection of states of consciousness which distributively exist throughout the physical and subtle bodies. Each organ has a primitive consciousness of its own. That primitive consciousness allows it to perform functions specific to it. Then come the various systems. The cardio-vascular system, the reproductive system and other systems have various organs or body parts working at slightly different stages of a single process. Like the organs, there is a primitive consciousness also associated with each system. And these are just within the physical body. Similar functions and states of consciousness exist within the subtle body as well. So individual organ consciousness is overlaid by system consciousness, overlaid again by subtle body counterparts and consciousness, and so ad infinitum. 3: Mantras are tools of power and tools for power. Each mantra is associated with an actual sage or historical person who once lived. Although the oral tradition predates written speech by centuries, those earliest oral records annotated on palm leaves discussed earlier clearly designate a specific sage as the "seer" of the mantra. This means that the mantra was probably arrived at through some form of meditation or intuition and subsequently tested by the person who first encountered it. You can use fire either to cook your lunch or to burn down the forest. It is the same fire. Similarly, mantra can bring a positive and beneficial result, or it can produce an energy meltdown when misused or practiced without some guidance. There are certain mantra formulas which are so exact, so specific and so powerful that they must be learned and practiced under careful supervision by a qualified guru. Some of you may be interested or even fascinated by the discipline of mantra, but feel somewhat overwhelmed by the array of mantras and disciplines, astotaras and pujas you find in here. If so, then this chapter will be of use to you. It contains some simple mantras and their common application. They have been compiled from vedas and upanishads, drawn from the various headings of the deities or principles involved. These mantras address various life issues which we all face from time to time. If you want more information or more mantras relating to the deities or principles involved.